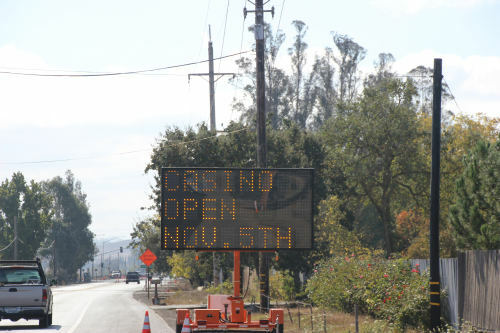 The most recent (and bigger) Sonoma County casino opens on November 5, 2013. 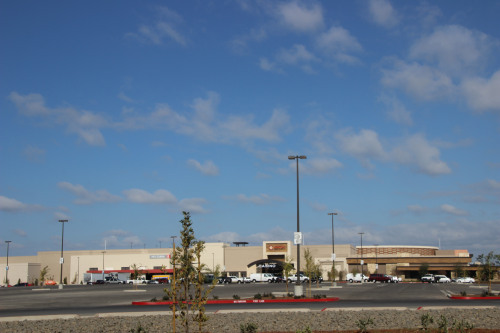 Graton Resort and Casino, at the northwestern edge of Rohnert Park, has spent a long time in development. If you count the period of time spent by the tribe getting federal recognition, (1992) it’s been twenty years. Just the fight to open the casino has gone on for at least 13 years. I drove up to one of the entrances, off Labath Avenue in Rohnert Park, and asked if I could drive inside and take pictures. The pleasant young man at the security kiosk politely told me no, I could not. I drove down to another business’s parking lot and took a couple of shots. At the western end of the Expressway I got a few more. The most interesting thing to me about the Federated Indians of Graton Rancheria is their tribal chair, Greg Sarris. Sarris is a professor at California State University Sonoma and a writer. He is best known for his short-story collection Grand Avenue, but my favorite book of his is the biography of Pomo weaver Mabel McKay. The Graton tribe endowed a chair for him at the college. Jobs. Yes, there are some caveats for working for a tribe. They are not bound by the same employer laws that other businesses are. 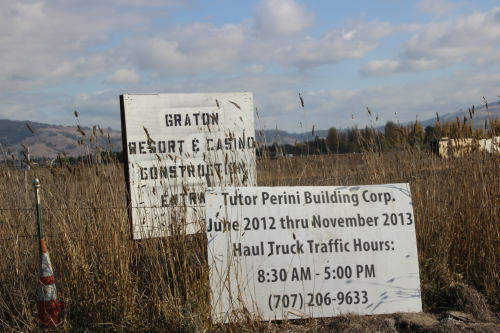 Still, the Graton Resort behemoth will bring jobs. I’ve talked to two people who work in my neighborhood grocery store, who finished up blackjack dealer training and completed all the paperwork to work there. The wage is fair, they say; there is a modest benefit package, and the chance of tips. Both plan to continue working at the store, too. Both were excited. The complex has a hotel and at least two (probably more) restaurants. There will be food service jobs, cleaning and janitorial jobs and security jobs. Many of these are low-paid, but good entry level, and don’t look bad on a future job application. Wealth to the Tribe. The immediate benefit of a casino, at least theoretically, is that it brings profits to the tribe; enhancing housing, health and educational benefits for the members. We have stories of highly successful tribes, like some in the state of Washington, who started with casinos, sent a generation of youth to college, and diversified out of the gambling industry into other business and are doing very well. We also have horror stories of tribal chairs who ruthlessly disenrolled whole swathes of people from the tribal rolls in order to maintain financial and political control. We have stories of gambling contractors brought in to run the casino, who ripped off the tribes royally. 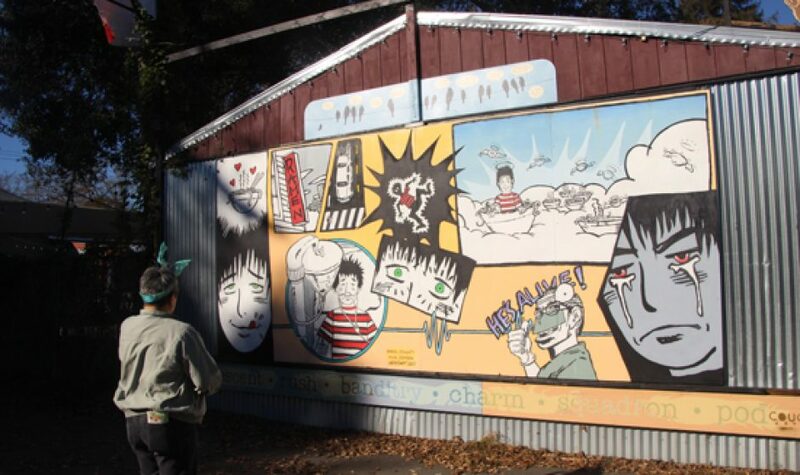 The members of Graton Federated have heard all those stories, too. Let’s see if they’ve learned from history. Cheap food. Yaay! One of the draws of a casino is pretty good food offered inexpensively. 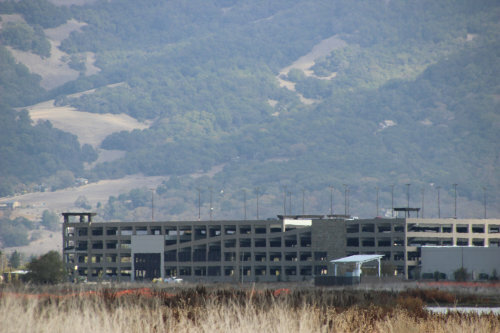 Looking at Graton Resort, I’m guessing at least one restaurant in the place will be pricey. I’m guessing at least one will offer a dynamite buffet for about $10. Cheap Booze. Same reason, same reaction. Inexpensive drinks also go on the Cons list, though, for obvious reasons. Cheap Entertainment. The days of casinos bringing back Tony Orlando and Dawn seem to be over. I’m hoping Graton brings in solid second-tier performers and provides some competition to the former Luther Burbank Center. Wealth to the County. The tribe endowed a chair at the local college; admittedly, for their own chairman, but still. They lavished money on the Rohnert Park school districts in the early 2000s. they shelled out money with Comcast for a local ad campaign, using this upbeat little ditty. It’s likely that they will negotiate some kind of a deal with both the county and with the city of Rohnert Park to pay for increased services, since the theory is that casinos drive service costs. Casinos and resorts also bring tourists, who may decide to venture away from the slots or the gaming tables and go wine-tasting, bicycling or kite-flying, presumably spending money along the way. Traffic. Let’s face it, Sonoma County roads are terrible. 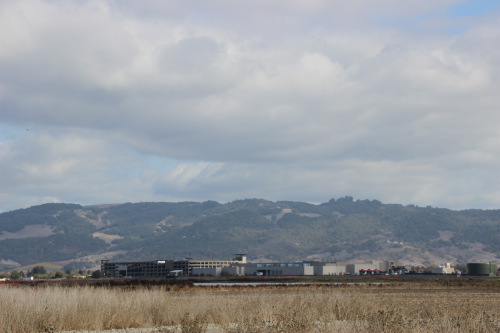 the Rohnert Park Expressway was not built to handle a thousand extra cars a day, which is what the casino is hoping for. Gridlock on 101, even with the improvements made in the last 10 years, is a daily fact of life and now will get worse. I expect the Expressway, HIghway 116 and Stony Point Road to all feel the effects of the casino — and all of those are surface streets people use to stay off the freeway. If I worked on Labath Avenue, I’d be hitting my head against the wall right now. This is not going to be good. In addition to wear on the roads, cars bring other things, like accidents and pollution. Drain on Public Safety Staff. RP chose, decades ago, to use a “Public Safety Officer” system instead of having separate law enforcement and fire protection agencies. What this means in real life is that fire protection often gets shorted in RP. Santa Rosa already informally provides fire service to RP through their mutual aid agreements, and SR firefighters do not trust the training or capability of RP staff. All of this could be exacerbated by a big party-place, right on the edge of town. Gambling addiction. This is always brought up as a concern. I haven’t seen any recent studies that show an increase in gambling addiction when a casino comes to town. There probably is an increase is gambling, because… duh, casino. Yes, it is worrisome that children might go hungry, or lose their housing, because Mom is taking her paycheck to the casino. That argument seems to get weaker once you already have one casino though. We will have to see. Electricity. This puppy is going to pull a lot of juice off the grid, in an area with aging and saggy infrastructure already. The same will be true for water, sewage and garbage. The question is not if the tribe will provide money for the services; it’s whether they will pony up enough to cover the increased costs. Wetlands Damage. This one is all me. West of the casino is pastureland and wetlands. It is clear the tribe has already done some mitigation (they probably had to), but I worry about what the cars, noise, garbage, and lights are going to do to the fauna of the area. I’d have this same question if it were a Costco — but a casino brings more noise and activity. The song. Having to listen to this. Really, it’s catchy and everything. Now, can someone make it stop? Anyway, it’s just a couple of days away. We’ll see what happens. This entry was posted in View from the Road and tagged Gambling, Gaming Tribes, Graton Resort and Casino, Rohnert Park, Sonoma County. Bookmark the permalink.